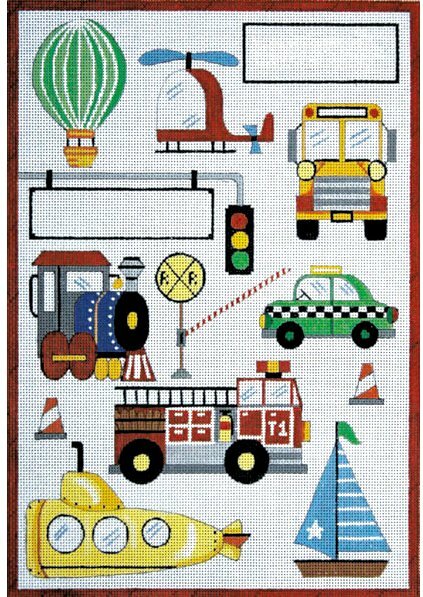 An Alice Peterson needlepoint canvas called Transportation II AP3062 that has cars trucks planes helicopters - perfect for a boy's room. It features a space to stitch a name or other letters. The design is handpainted onto 13 mesh mono Zweigart needlepoint canvas and measures 11" x 16". You can buy this Alice Peterson needlepoint design as canvas-only or as a needlepoint "kit" with wool or silk threads. We supply enough thread for stitching in needlepoint basketweave stitch. If you think you will need more thread than this please let us know and we will make every effort to accommodate you. For wool you have a choice of Waverly or Planet Earth. Waverly wool comes as a 3-ply yarn and you will use 1 or 2 ply. Planet Earth is single ply for 13 mesh canvas. For silk we supply Planet Earth fibers which is also single ply for 13 mesh canvas and easy to stitch with. If you require stretcher bars we recommend a pair of 15" and a pair of 20" and some thumb tacks. This Alice Peterson Transporation needlepoint canvas usually ships within 1 week. If you are in a hurry please let us know or inquire about availability before you order.